Start by opening a DS9 window before running this task and by editing the parameters for the task "objects". only for the stars in this file. (e.g. SN03ib), which must be identical to the name in the file snphot$objects.coo. the first supernova of the night. The order is not important. Use "INDEF"
that you do not repeat images taken with the same filter. The name of this file must be entered in the "imsets" parameter. Make sure that this is the same file used with the task "standards". to the standard system, derived from the Landolt standards. 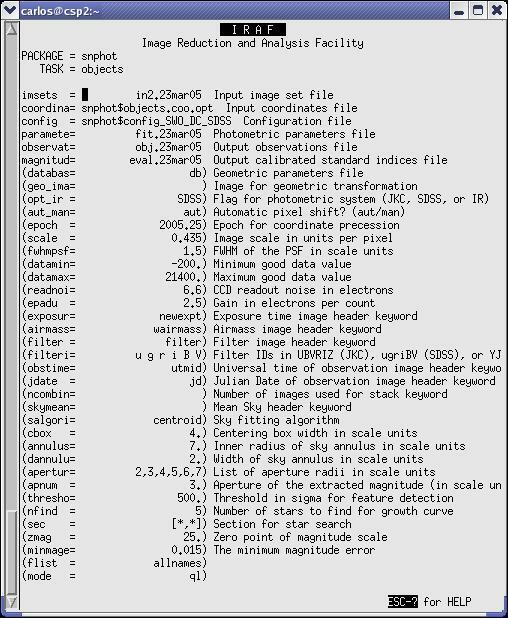 program objects in the standard system (eval.14dec03, in this example). between (x,y) pixels and equatorial coordinates. directory you can leave "geo_image" unspecified. depending on whether you are working with Johnson, SDSS, or IR images. doesn't work, in which case you must set it to "man". largest radius is 7 arcsec, which is that used for the Landolt standard. stars to find in each image. be used to identify the brightest stars. If the task doesn't find "nfind"
you delete those points, and any other deviant point with the "d" key. you can read off the graphics window) lower than 0.01 mag, use "q" to quit. the largest aperture and that specified with the "apnum" parameter. negative number amounting to a few hundredths of a magnitude. with the second image of the image set. (e.g. Phot, or Phot?) which will be saved for future use. "parameters" parameter) previously derived with the task "standard"
You will have two new text files at the end. In this example "obj.14dec03"
contains the instrumental magnitudes and uncertainties. The file "eval.14dec03"
is a text file with the magnitudes in the standard system.